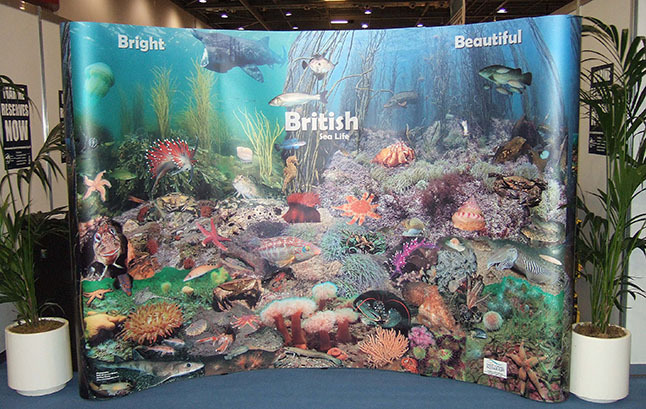 This stunning 2.9 metres x 2.2 metres curved pop-up display is ideal for promoting and raising awareness of British marine life. 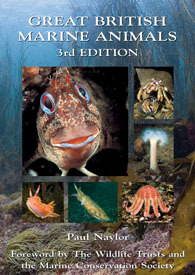 With photographs of 80 different species in a panoramic montage, it can be used as a stand-alone display or as a backdrop for a specific conservation or educational campaign. The display, produced with sponsorship from the National Marine Aquarium, can be borrowed by any organisation involved in marine life conservation, and we only charge for incurred carriage costs. The current version is for use indoors or in a good waterproof marquee; we hope to develop an outdoor version in the future. The display folds away into a container that will fit in the boot of a medium-sized hatchback car (e.g. Focus). Container dimensions 99.5 x 59 x 40 cm, total weight 32 kg. Volume 8.2 cubic feet (units often used by couriers for pricing). Within the display container, there are 2 spotlights that enhance the vibrant colours and, also, instructions for display assembly. The instructions are straightforward, but we do ask that users follow them closely so the display can last for a long time to come.